Following our branding and website development for GTXM, Thump was required to design an eye-catching and informative brochure to explain their new business offering. 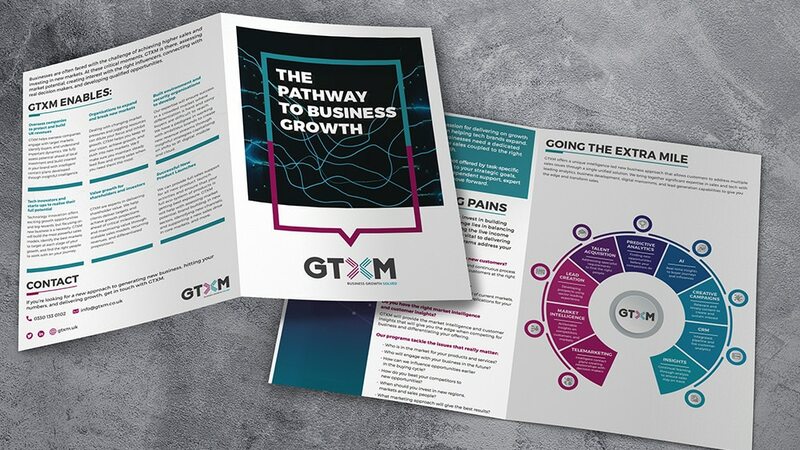 The focus of the GTXM brochure was to explain what they did, identify the audience, and address their current challenges and pain points in a benefit-based tone of voice to direct them to the solution of GTXM. In order to display the core USP of uniting multiple new business development disciplines, we created an infographic. Infographics are a useful tool to displaying lots of information in bite-sized pieces in a visual demonstration. The core colours of GTXM were used throughout the brochure alongside website design concepts in order to create cognitive recognition and strong branding. The brochure is highly visual and creative whilst highlighting core information required by the audience of GTXM. This brochure will be used digitally and also at events and for prospective leads.